If your a photographer or someone like many of us, wish they were a full time photographer… you have seen Trey Ratcliff’s work. Most of us in the office have Trey in our circles on Google+ so we get to see photographs he has taken around the world throughout our day. 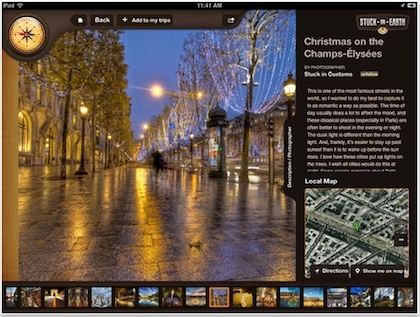 We have mentioned HDR photography before as it relates to iPad apps that allow you to take High Dynamic Range photos. Trey does HDR completely with his full size camera so places and details you may have missed really show through. His photos appear to be sharper and brighter than we may see on our best day at the location. 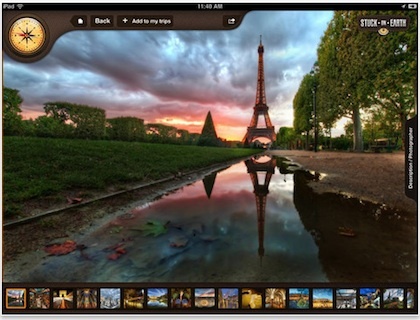 To help share his photography, Trey Ratcliff has release a iPad app called Stuck On Earth. 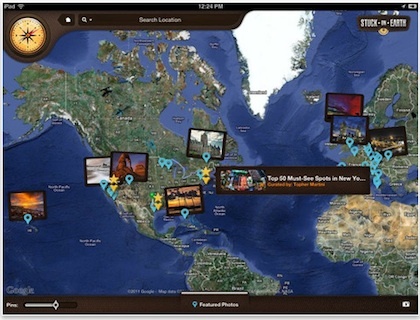 A free app that takes you all over the world via his photographs. The Stuck On Earth photos are best viewed and appreciated by location. We aren’t seeing in the current version of the app any way to narrow our search to a type of photography. This doesn’t stop us from enjoying seeing places we will never get to travel to and places we have seen but didn’t see through our eyes the detail Trey has through his lens. ➤ Discover millions of amazing places to visit – the best of the best. ➤ A customized experienced based on your personality type – Photographer, Explorer, or Daydreamer.